Raven Osborn thought long and hard about continuing a PhD at the University of Rochester. Other minority students she knew at the Medical Center had also felt the isolation, the constant “being on edge” and “code-switching”—shifting the way they express themselves—that comes with being an underrepresented minority in a STEM field. “Can I do this for another five and half years?” she wondered. Antonio Tinoco, a DREAMer who was born in Mexico and raised in Los Angeles, is a fourth year PhD student in the department of chemistry on the River Campus. He can remember only one or two occasions when a visiting faculty member of underrepresented minority background was invited to give a seminar in his department. 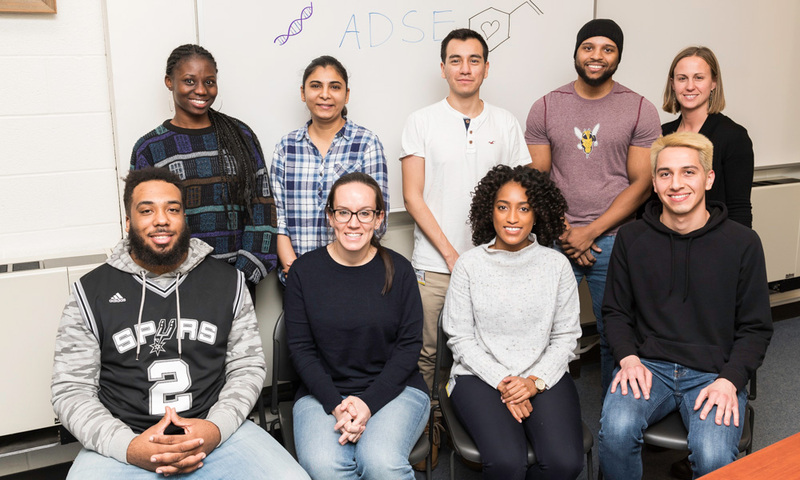 Instead, Tinoco, Osborn, and five other graduate students have banded together to form the University of Rochester chapter of the Alliance for Diversity in Science and Engineering (ADSE). The mission of the national ADSE, which was founded in 2014, is to increase the participation of underrepresented groups in academia, industry, and government through graduate student organizations that reach out to students and scientists of all ages and backgrounds. The chapter has been certified by the University and will receive funding through the University’s David T. Kearns Center for Leadership and Diversity. ADSE’s goals fall well within the Kearns Center’s mission to expand the educational pipeline through the doctoral degree for low-income, first-generation college, and underrepresented minority students, says Liz Daniele, the center’s assistant director for graduate diversity. “Overall, I think that the University of Rochester community, particularly at the graduate level, will really benefit from having a chapter of the Alliance for Diversity in Engineering and Science on campus,” Matson says. Osborn, who is serving as the chapter’s treasurer, does not regret her decision to stay at Rochester to pursue a PhD in translational biomedical science. “I’ve been very lucky to work with faculty members like Tim Dye, Steve Dewhurst, and Juilee Thakar,” she says. Osborn received a medical center community outreach award as a leader in the Rochester Young Scientists Club’s program, which encourages pupils at inner-city elementary schools to start thinking like scientists. She is excited to be serving on the search committee for a new vice president for equity and inclusion at the University. She is hopeful that ADSE will bring together underrepresented graduate students, now separated by Elmwood Avenue “divide” between the River Campus and the Medical Center and the separate “silos” of their STEM disciplines. And she agrees with Matson that the University will benefit from having a chapter of ADSE. "New grad student chapter tackles underrepresentation in STEM"